As Israel continues airstrikes on Lebanon, the country is now threatened by its worst ecological disaster. At least 35,000 tonnes of oil gushed into the Mediterranean, after Israeli warplanes hit fuel tanks of the Jiyyeh power plant, south of Beirut. The spill has spread along 80 km of the Lebanese coastline; winds have since pushed the oil northwards threatening the Syrian coast. Though a leak from one of tanks has now stopped, there are fears that more oil could spill out into the Mediterranean because another fuel container is still on fire and is in danger of exploding. A thick cloud of black smoke from the fire has polluted the air over Beirut and its suburbs. Officials have warned residents of the coastal area to keep their windows shut and stay away from the oil slick as the fumes can cause skin and breathing problems. Media reports say the Lebanese government has neither the money nor expertise to deal with the crisis. Following its appeal for help, cleanup teams, organised by the United Nations Environment Programme, based in Nairobi, and the European Commission's Monitoring and Information Centre, are now busy skimming the sludge. But the ongoing war is hampering the operation. According to the Lebanon environment ministry, the cleanup process will take at least a year to complete and the cost could run up to us $130 million. 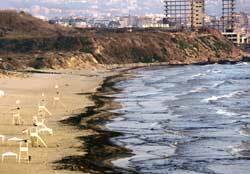 The thick oil slick is also threatening marine ecology, especially fish spawn and sea turtles nesting on Lebanon's coast, and the green turtle, which is endangered in the Mediterranean. Experts fear that following the large-scale oil spill, the marine ecosystem could take years to recover.